I’m in love with the book, Taller Flora by Carla Fernandez. In it she describes the various ways of putting webs (geometric shapes of cloth–squares, rectangles, triangles) together to create dresses, pants, skirts, blouses, shirts, sashes and jackets. 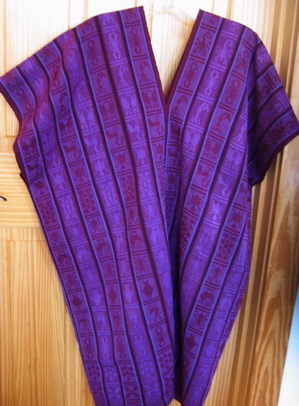 Fernandez describes indigenous pre-Hispanic techniques for constructing garments, and compares this with western techniques. Westerners cut cloth to fit the body. Indigenous weavers feature the textile and, make few, if any, cuts into the cloth. Their clothing is loose fitting, comfortable, and easily adaptable to another future use. The weaving takes center stage. Last summer, I eyed a piece of hand woven cloth tucked away on the bottom shelf case of the B&B where we were staying. It’s gloriously rich color spoke to me, and I bought it. It’s been stashed away and yesterday I decided to take it in hand and create a huipil. Imagine three long, rectangular pieces hand woven on a back-strap loom, each panel (web) 14-1/2” wide x 80” long and hand-stitched together, featuring intricate patterns of stars, birds, fish, crabs, lobster, bugs, deer, and rabbits. It is a brocaded piece from the coastal Mixtec village of Huazotitlan, Oaxaca. I don’t know for certain, but am assuming, that it is dyed with cochineal (red), indigo (blue) and caracol (purple) based on the price I paid for the cloth ($180 USD) — and that was not yet made up into anything! 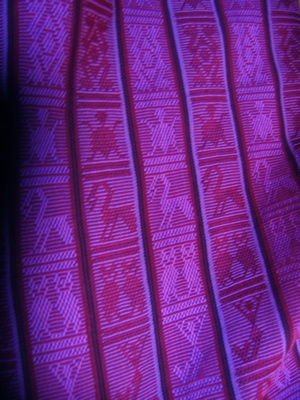 Above: Example of weaving on a backstrap loom. Lovingly, I opened the seams and took apart the hand stitching, thinking about the women who created this fabric. How many women’s hands were there? Were they mother and daughter? Dear friends or sisters? First using small basting stitches, I sewed two panels together at the center seam, being sure to match the direction of the pattern in the weave. I ended the seam at the opening of the neck hole, measuring how big I wanted this to be so the garment would go over my head. I made the total size of the opening 16″, and marked the cloth equally front to back with a straight pin (and tailor’s chalk) so I would know where to stop sewing. I continued to baste from the hem toward the neck on the other side closing the seam the same amount of inches front to back. Then, I held the side seams together to see how much of an armhole I wanted. I decided on a 12” opening for the armhole. So I measured 12” from the shoulder fold down the side-seam, marked it with a straight pin, and began to baste from the hem going up toward the straight pin. Not being an accomplished Mixtec seamstress, I took the fabric to the sewing machine and used a basting stitch (#4 stitch length on my machine) to sew all the seams together. I decided not to make the machine stitches smaller (#3) because I didn’t want to pull the the brocade fabric together too tightly and I wanted the flexibility to take the garment apart later in case I wanted to do something else with the material. Then, I steamed out all the seams with my iron (gently) so they laid flat. I finished the huipil by folding the bottom over into a ½” hem and sewing the hem by hand using blind stitches. The entire project took me about 3 hours. I didn’t need to finish off the neckline or armholes because the selvages are perfectly beautiful. I’m really pleased with how this turned out. A huipil of this quality would cost $500+ in any shop in the Santo Domingo – Alcala de Macedeonia neighborhood! Norma Hawthorne is a North Carolina fiber and jewelry artist, and university administrator, who writes about Oaxaca and living in Teotitlan del Valle on her website www.oaxacaculture.com She is currently organizing weaving and natural dyeing workshops with Federico Chavez Sosa and Eric Chavez Santiago in Teotitlan del Valle. ADDENDUM: June 5, 2008. I’ve had lots of requests since writing this post for where to purchase the Taller Flora by Carla Fernandez book. I cannot find a U.S. source and intend to try to track down this down on my upcoming trip to Oaxaca. Meanwhile, if you go to the website: www.flora2.com/ you can download the book from a PDF file. This entry was posted in Clothing Design, Oaxaca Mexico art and culture and tagged backstrap loom, coastal Mixtec village of Huazotitlan, dress, huipil, huipil cost, indigenous clothing, natural dyes, Oaxaca, Oaxaca weaving patterns, sewing a huipil, Taller Flora Carla Fernandez. Bookmark the permalink. By the way, I’m presenting a work about textiles in a mexican handicrafts class on university, I wonder if you let me use your picture to show a Mixtec example for my class. The last I heard, Carla Fernandez was living in Mexico City, but I’m not certain. Her book is out of print. I have been trying to find copies for a couples of years but can’t locate them. I don’t believe that Taller Flora sells finished pieces; rather it is a project working with indigenous weavers and documenting the clothing construction process. 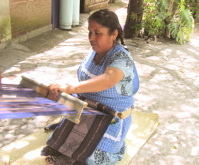 Any textile that you would buy from Remigio Mestas (Oaxaca and San Miguel de Allende) would be authentically made per the techniques described by Taller Flora and Carla Fernandez. Thank you so much for your interest and question! Do we get to see a photo of your finished garment? It sounds beautiful, but difficult to imagine. I’d love to see it!